Tony Ferrieri: The script calls for a row house, but that kind of structure is too long and narrow to allow for the kind of action onstage we wanted. In a row house, you wouldn’t even be able to see the front door from the living room! So Tracy and I had to decide what kind of structure would be the best. We agreed about the kind of structure it would be – a house more like you would find in Shadyside [a detached house] than on the South Side [a rowhouse], for example. But it’s always a collaboration with a director. Sometimes there’s a give and take to a design… When we were trying to decide what kind of wallpaper to use, I decided on one that I thought would work, and Tracy didn’t like it. 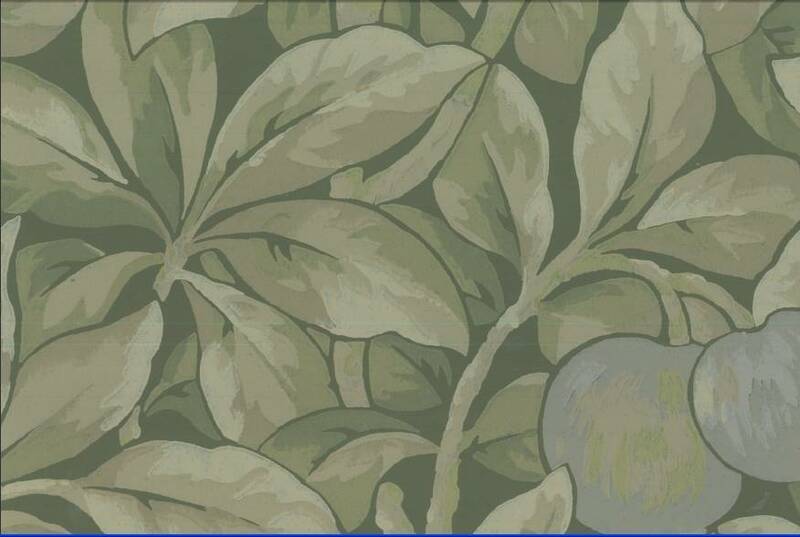 She wanted blue wallpaper, but I thought green would be funnier. In studies on color and their effect on emotions, green, green-yellow and green-blue were found to be the most arousing and evoked mostly positive emotions and yellow was found to be the most attention-getting color so I thought the combination of the two would be the funniest and most eye-catching combination. 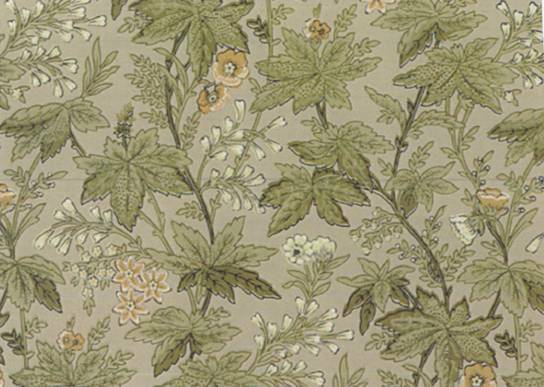 Also most period wallpapers and paint treatments used greens or yellows or reds or pinks or off-white rather than any blues. And also initially the costumes were leaning toward browns, blues and navy so there needed to be some contrast against the background of the set. Michael [Krass the costume designer] liked the green color, because it worked well with the costumes he was creating. So I told Tracy that Michael liked it. That’s a big part of working in theatre and working with other artists, is making sure that our designs will work well together. I wouldn’t want to use a color on the set that would be a bad choice with the costumes. 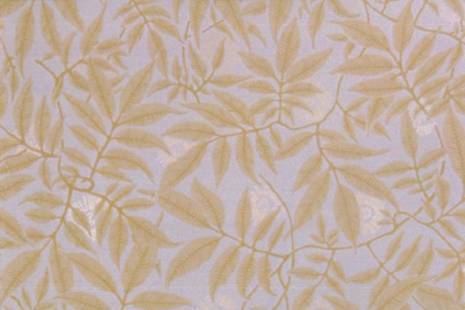 The wallpaper Ferrieri and his team ended up using for the set of Louder Faster. A research image that Ferrieri used to guide his design for Louder Faster. Another example is when we were deciding on whether to have a ceiling. We thought that would just make it too hard for Andy [Ostrowski the lighting designer], so we ended up not having a ceiling. Collaborating means you have to kind of look out for the other designers on a show. In terms of the set design as a stand-alone concept, three things that really guided my process were having a ground plan that would allow for varied and free-flowing movement to accommodate the many entrances and exits, making sure that it was funny and colorful, and being true to the period style and architecture. The “Designing Louder Faster” series will include more special behind-the-scenes looks at the costumes, lighting, and sound design, with designers Michael Krass, Andy Ostrowski, and Brad Peterson as well as an interview with Literary Manager and Dramaturg Carlyn Aquiline about what goes into commissioning a new play at City Theatre. Keep checking back for more! In Tarell Alvin McCraney’s Marcus; or the Secret of Sweet, the title character’s friend, Osha, asks him “Marcus, what’s the secret?” He answers “Ain’t no secret. I’m just dreaming.” The questions that follow are telling. “Like sweet dreams?” Osha asks. “Or beautiful nightmares?” his friend Shaunta wants to know. Dreams provide the background for the lyrical and poetic world through which Marcus must journey to learn about his father and, more significantly, about himself in McCraney’s coming of age and coming out tale, set in the projects of the fictional town of San Pere, Louisiana and the surrounding bayou. 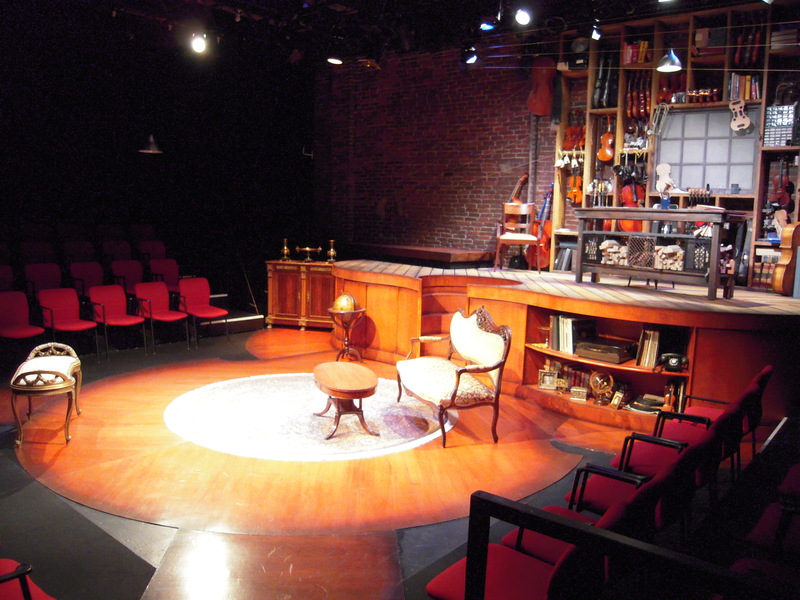 The world the playwright created requires some innovative thinking from the set and lighting designers who have the hard job of making a dream world out of reality. When asked what instruction he gave designers, director Robert O’Hara says he told them “It’s A Midsummer Night’s Dream on the bayou. This is a mystical dream world. But Marcus’s dream is a nightmare.” Scenic designer Tony Ferrieri and lighting designer Andy Ostrowski took that idea and ran with it. Both tried to incorporate a feel of mystery and magic (and sometimes a little something sinister) to exemplify the journey Marcus is making, resulting in the sense that one never knows what could be lurking just beneath the surface. Ferrieri strove for that sense of secrecy when using water in his set design. 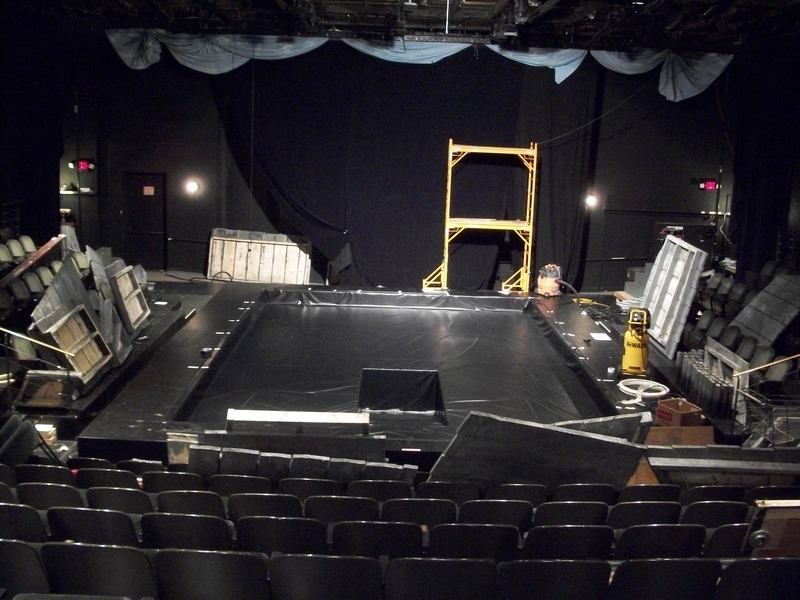 Four pools of water dot the stage, separated by winding boardwalks that twist around each other before disappearing offstage or becoming part of other set pieces. The pools are deliberately lined in black to obscure the depth of it. To look at it, one can’t tell whether the water is one foot deep or nine feet deep, and that’s the way Ferrieri wants it – the darkness and depth of the water suggest the depth of the issues with which Marcus and other characters in the play wrestle. Of course, the water presents practical problems, as well. The weight could be an issue, but that doesn’t worry Ferrieri. Laughing, he says “I’m just praying nothing leaks!” The pools of water are right over the Gordon Lounge, but all the precautions have been taken and he doesn’t foresee any problems. 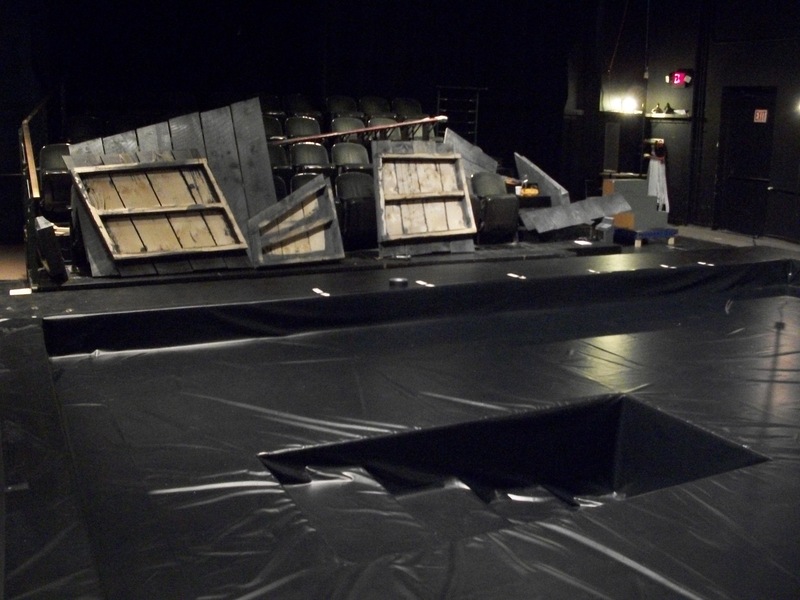 “We [the scenic crew] have been really careful to keep things like screws out of the pools. 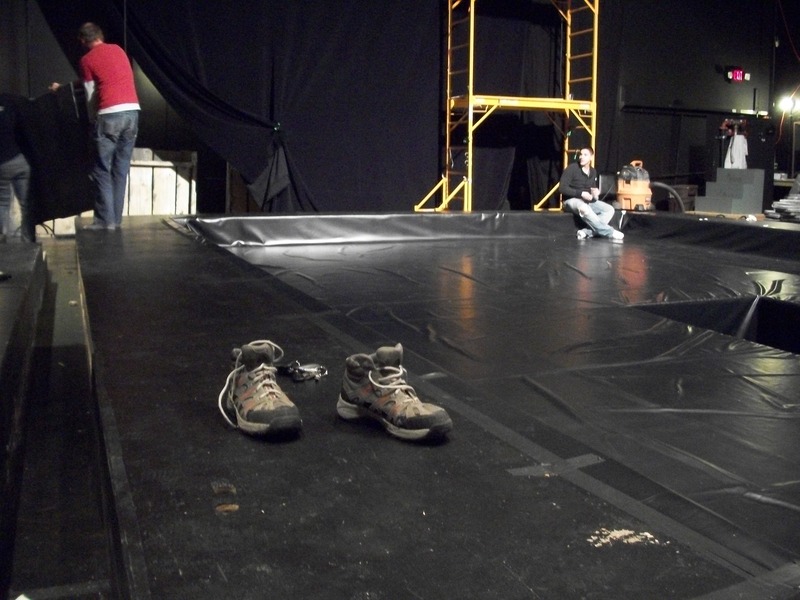 We don’t even wear shoes around them so we won’t puncture the lining.” That lining has created some challenges for Ostrowski’s lighting design, too. He asks, “Do you know why the Caribbean looks so blue? It’s not the water, it’s all the life that’s beneath the surface.” Lighting water is as much about lighting what is in or behind the water as it is about lighting the surface of the water. Ostrowski had to find a way to light the water without depriving it of its mystery. In addition, Ostrowski worked with his team to create a device that keeps the water moving. “Moving, moving, moving,” he smiles at the thought. “Always moving.” The movement is appropriate, since there’s nothing calm about the upheaval in Marcus’s life. Another way the designers have created a sense of instability with the water is through the use of rain; it adds to the motion of the water. In a play where water features so prominently, having rain onstage is fitting and Ferrieri doesn’t disappoint: it can fall in all of the pools simultaneously or in individual pools. The use of rain also allows the audience to see the dream that Marcus describes to other characters – a dream about rain. McCraney often lets the audience witness Marcus’s internal world, and one of the most interesting dreams we’re privy to is the “Sun shower” dream. In it, Marcus and his friends, Osha and Shaunta, perform a drag show to “Sun Shower” by Dr. Buzzard’s Original Savannah Band. Osha and Shaunta are Marcus’s “bests,” his best friends and confidantes, and like teenaged girls everywhere, they often tell him what to do. O’Hara likens Marcus to The Wizard of Oz, saying “The characters around Marcus are the interesting ones. They’re the ones that drive the action forward, and Marcus kind of goes where they take him. And Marcus is like Dorothy: we don’t really know if this is actually happening, or if it’s all in his head.” Ferrieri acknowledges that the idea of The Wizard of Oz and of the other characters helping Marcus on his journey influenced the set design. Wanting to create a magical world for the play, he incorporated the boardwalks after finding an image of a zig-zagging boardwalk through a misty forest. “The imagery I looked at when I was researching for this play is just a dreamy world. You never know what’s going to come out of there. And it’s emblematic of Marcus’s journey,” he says of the image and the set he created in response. City Theatre staff knows how to party! The holidays and the Winter Classic have come and gone (as have the vast quantities of food and drink heartily enjoyed by all). But as someone very wise once said, the show must go on. Without wasting anytime, the company for Tarell Alvin McCraney’s Marcus; or the Secret of Sweet was hard at work in the rehearsal room, and the staff was hard at work putting into place the elements needed for our next production. Marcus is part of McCraney’s Brother/Sister Plays which includes City Theatre’s 2008 hit The Brothers Size. 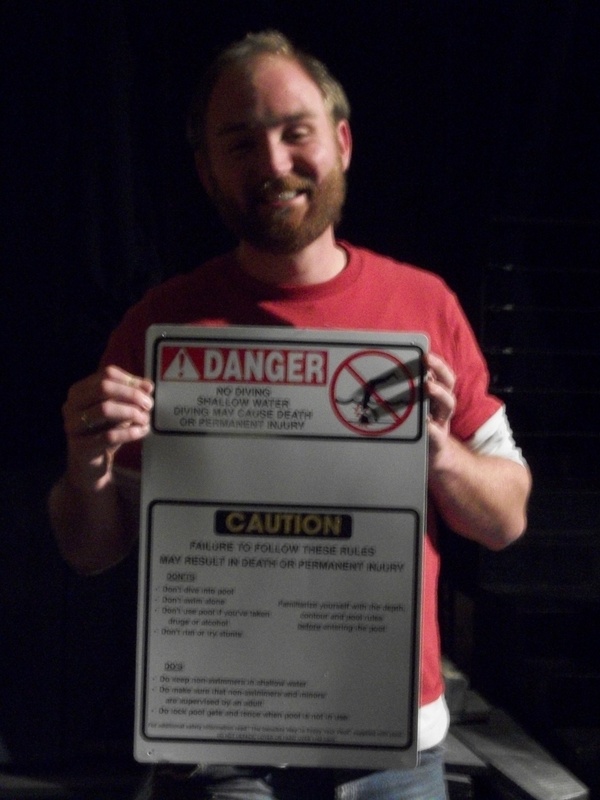 It’s customary for designers to make a presentation at the first rehearsal. Because Marcus requires some unique scenic elements, designer Tony Ferrieri and his crew needed to hit the ground running. Or it might be more accurate to say they needed to dive in headfirst. What will eventually be four pools of water framed by meandering wooden catwalks looks more like an advertisement for Hefty bags at the moment, with the stage carefully protected by pool lining. 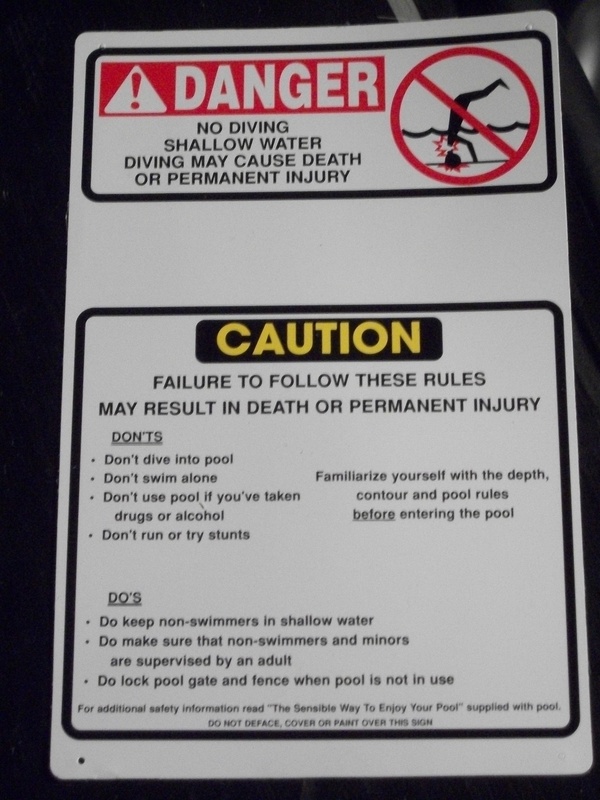 The crew walks on this liner without shoes to prevent damaging it, and a “no diving” sign jokingly warns against any actual diving. 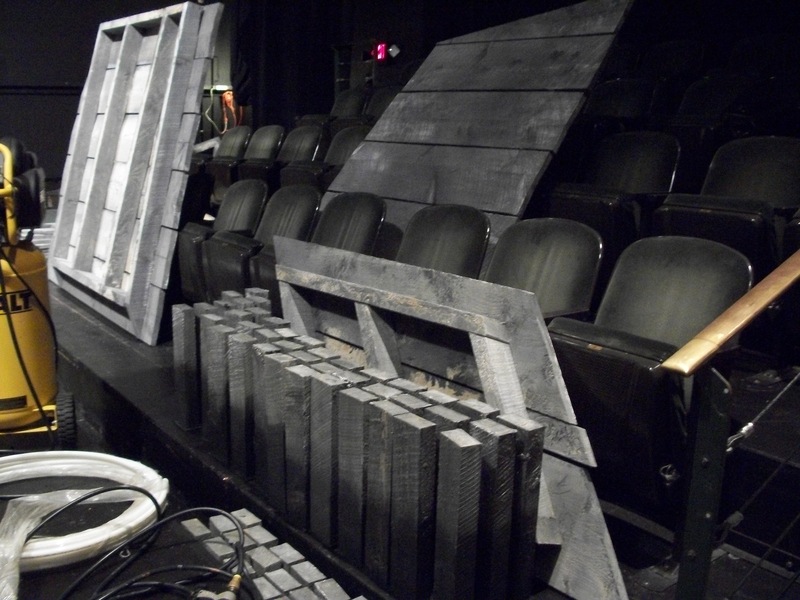 Scattered about the theatre are pieces of the set – weathered wood planks and platforms that will eventually makeup the aforementioned catwalks. The front row of the theatre is mere feet from the stage, ensuring that audience members will be up-close and personal with the action. 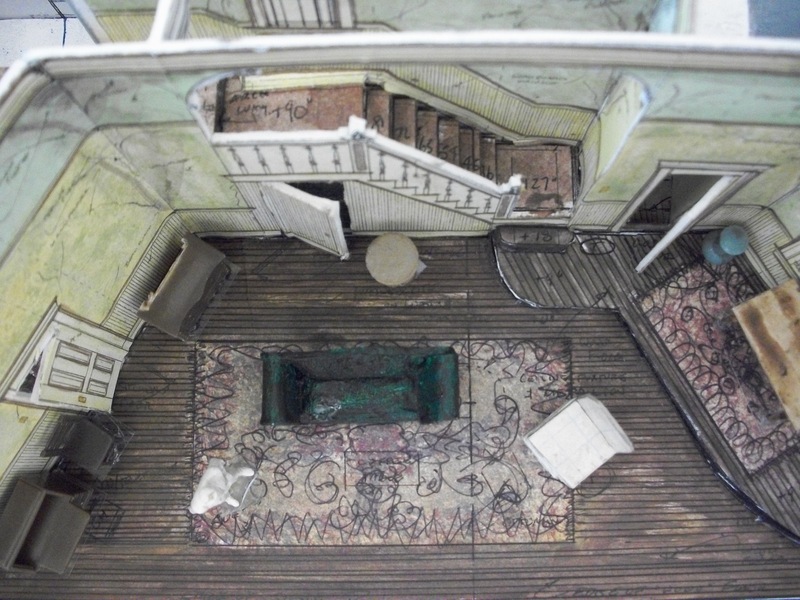 To see sketches and models of the set from the first day of rehearsal, as well as the progress made on the set so far, click on the photos below. 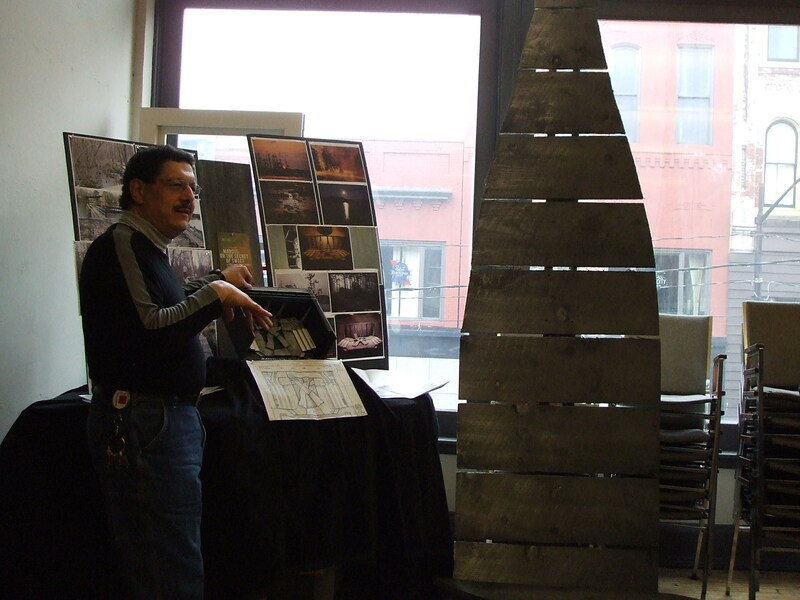 Scenic designer Tony Ferrieri presents the design of his set for Marcus. 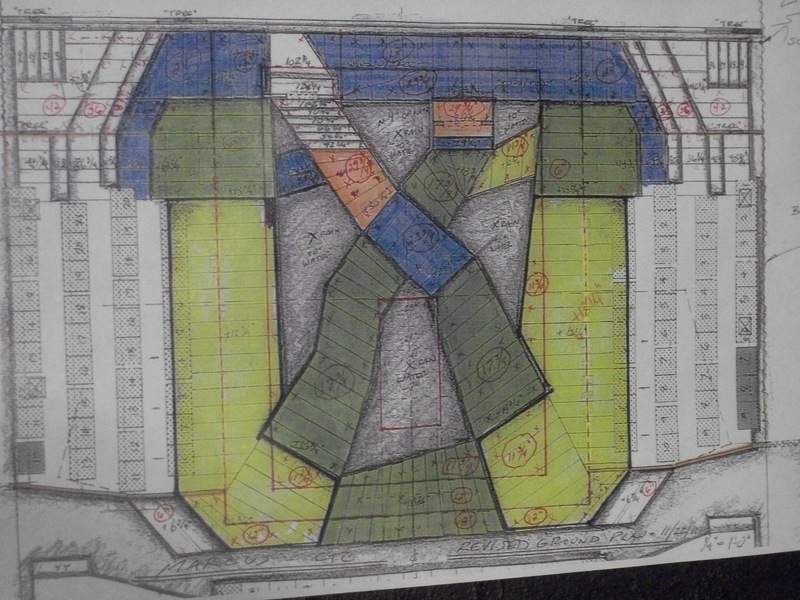 A color-coded ground plan of the set design for Marcus. 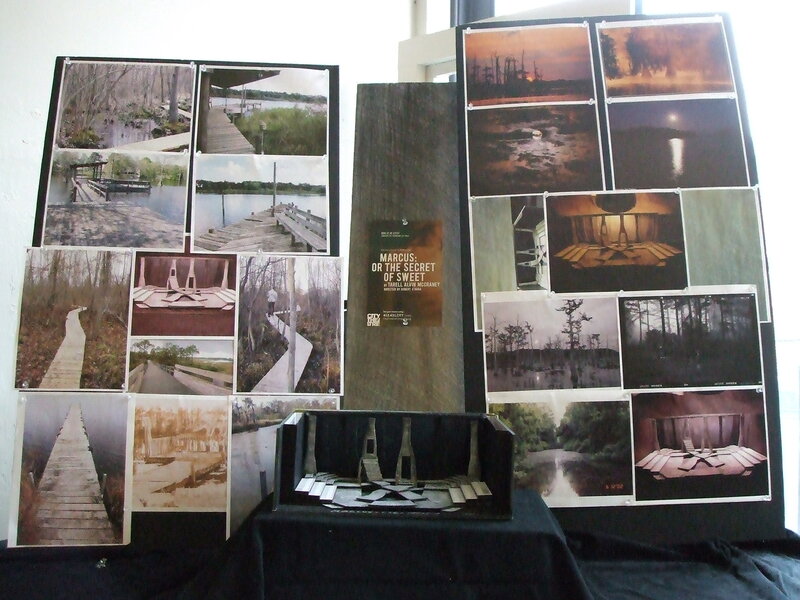 These research images helped inspire the set for Marcus. 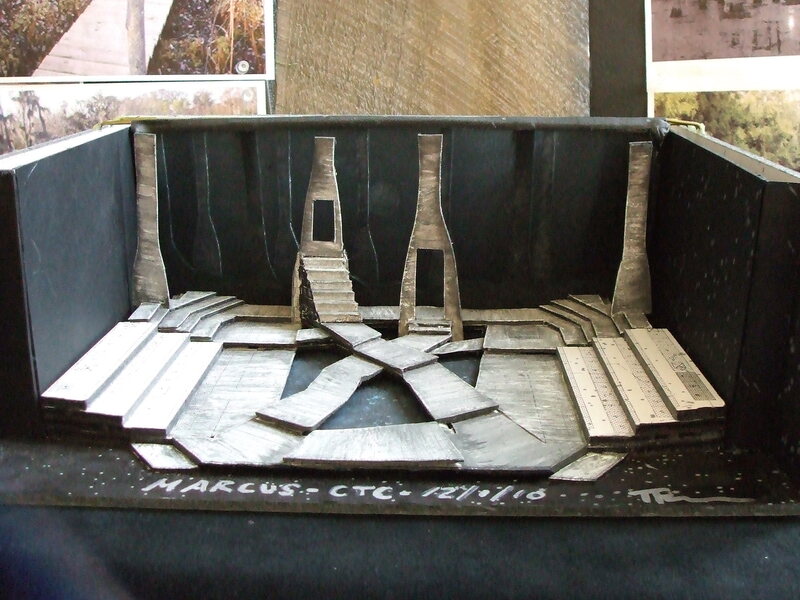 A model of Tony’s scenic design for Marcus. Tony and the scene shop guys discuss the build for Marcus. The scenic crew, and the start of the Marcus set. The beginnings of the build for Marcus. Shoes on the pool lining are a no-no. 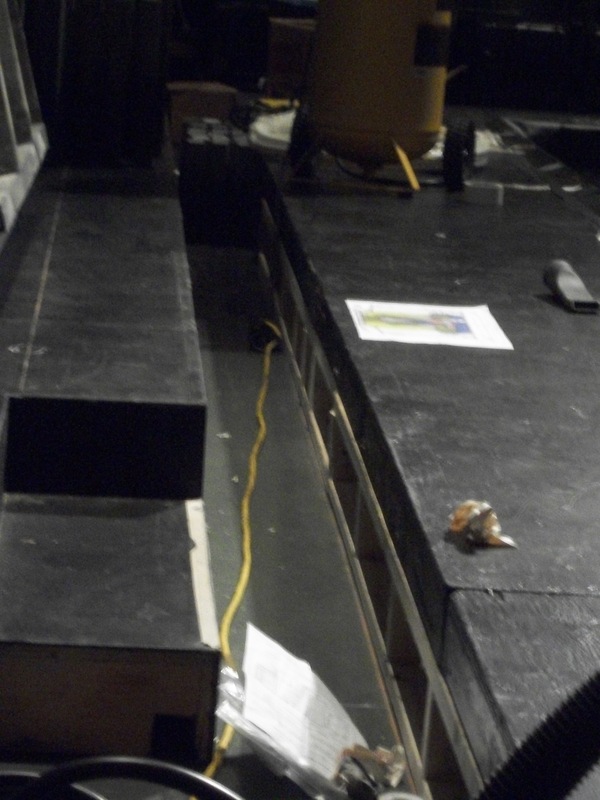 The action onstage will be very close to the audience! Soon this will be a pool full of water. Tony models with the satchel of “important information for the safe enjoyment” of the pools. Shaggy enforces the strict no diving policy on the set of Marcus. Want to see more more? Check back soon for more information about scenic, lighting, sound, and costume designs for Marcus and interviews with the designers. Posted by Molly MacLagan, Literary and Dramaturgy Intern. Tony Ferrieri’s set for The Morini Strad has been the subject of much praise, and with good reason! 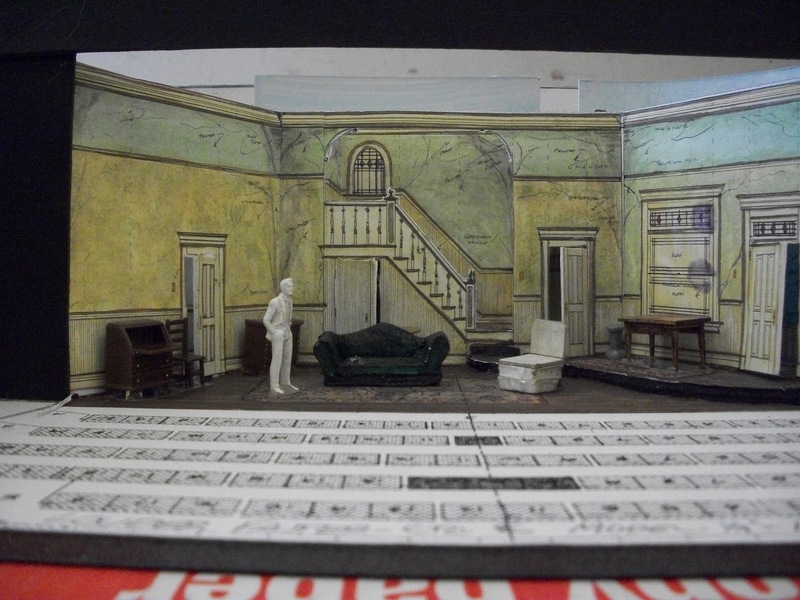 With so much attention going to this beautiful and innovative set design, we thought that Tony’s two cents on creating it would be almost as interesting as the set itself. 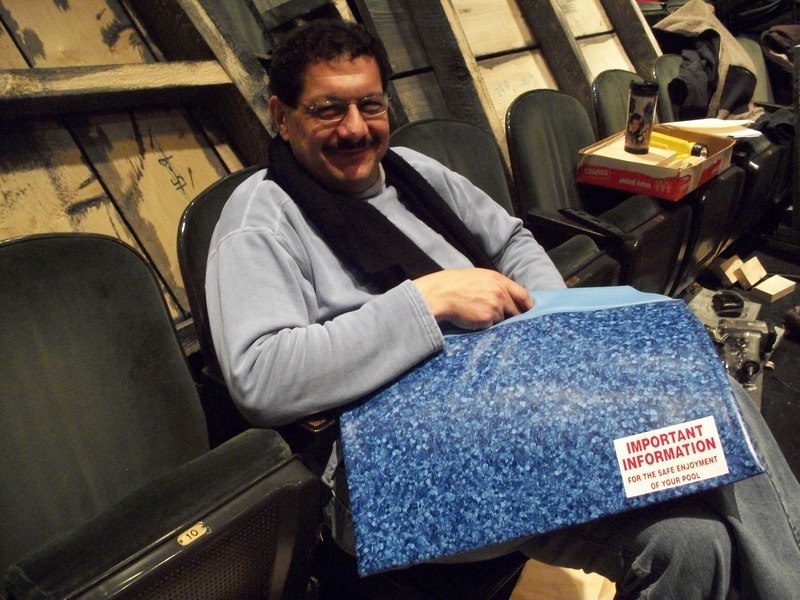 The resident scenic designer at City Theatre, Tony has been affiliated with City Theatre for 31 years! He has designed the scenery for The Blonde, the Brunette, and the Vengeful Redhead, Dr. Jekyll & Mr. Hyde, Speak American, and The Brothers Size, among many others. Next on the list for Tony, he’ll be designing the set for Marcus; or the Secret of Sweet. Molly MacLagan: When you receive the script for a show you’re designing, what is the first thing you do after reading it? Tony Ferrieri: I begin doing research [in this case] on Erica Morini and on the various locations in the play. For The Morini Strad that was researching locations like Upper West Side NY apartments, Mount Sinai Hospital rooms, Violin maker and repair workshops including images of Brian’s actual workshop and visiting Phillip’s workshop here in Pittsburgh, Mannes School of Music, the violin; in particular the Morini Stradivarius… etc. 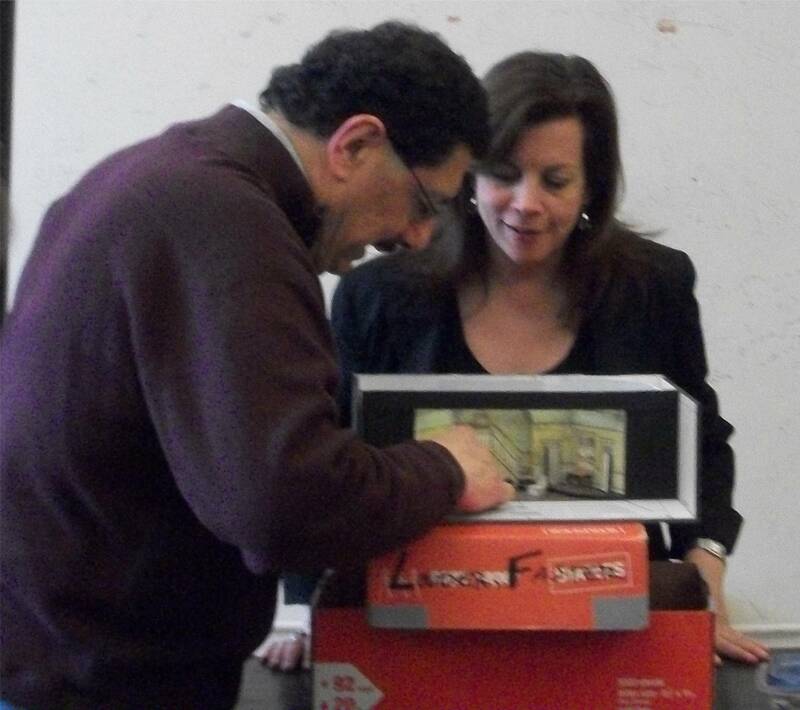 MM: What was your first thought about the scenic design when you read The Morini Strad? 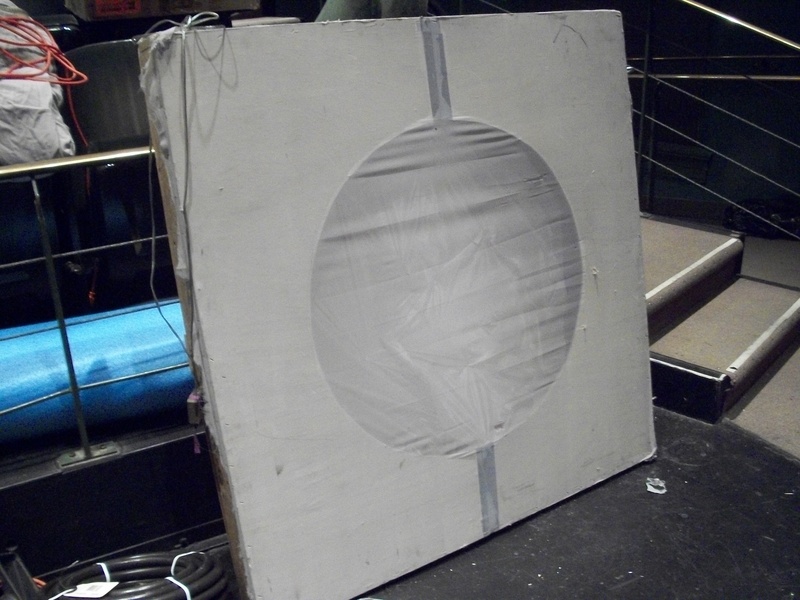 TF: ﻿Because of the sound of violin music I thought that the lines of the set needed to be curved rather than hard lines. The violin is also a curved and beautiful piece of sculpture as well, if you will, so I wanted to in some way use those curves and shapes in the design of the set as well. MM: Which aspect of designing for The Morini Strad excited you the most? TF: Mostly I just loved the play! I love plays that relate to the human condition. 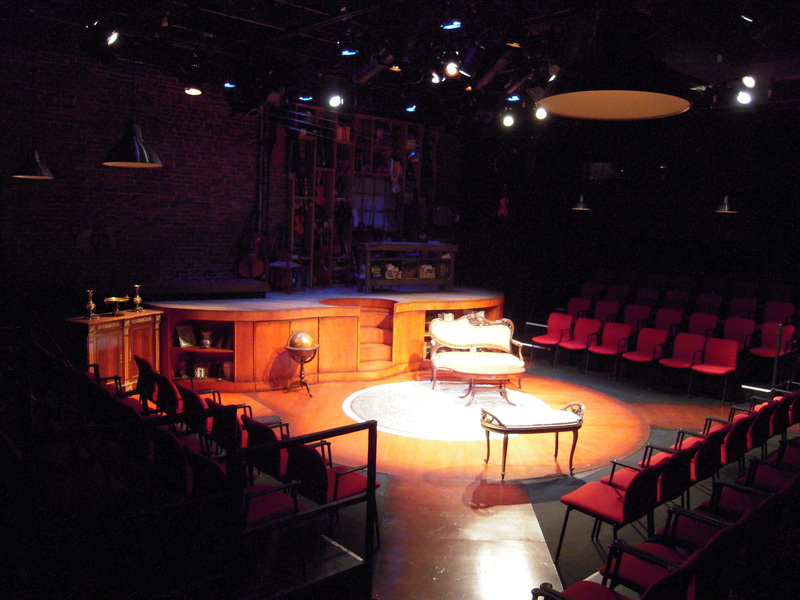 Plays that are about people and real situations and realistic relationships and real life situations. MM: Which aspect of it was the least appealing? TF: Really only the need for multiple locations. 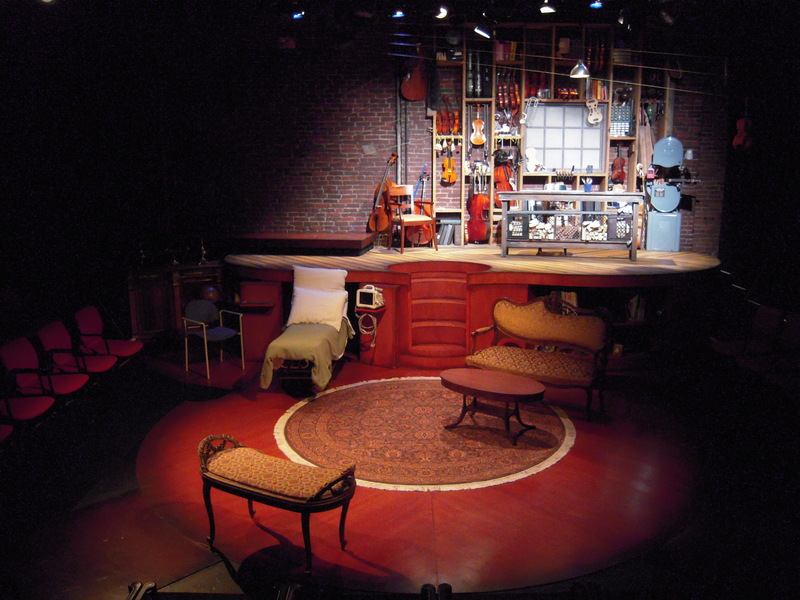 It is difficult, especially in the smaller Lester Hamburg space to achieve that in a set design, especially sets that require a bed to be onstage! Note the dreaded bed - a creative solution to a difficult problem Tony faced when designing. MM: My favorite parts of the design are the echoes of the violin itself in the set – the strings and the violin-shaped platform. How did you make the decision to essentially create a violin as the world where the characters would be playing? TF: It just really made the most sense for the play to in some way incorporate the shapes and curved lines of the violin in the set design. 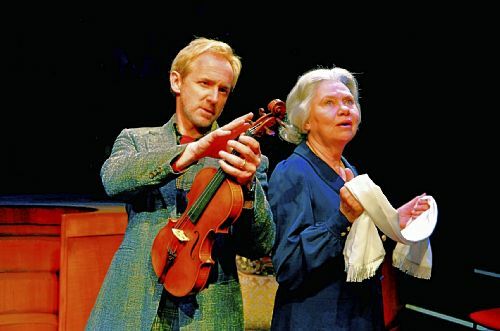 The Violin is like a third character in this play and is central to the plot and the story. So we decided to, sort of, deconstruct the violin use those lines and I used those shapes and different elements and parts of the violin in designing the set. Notice the echoes of a violin in the set design. MM: What is your favorite part of the final set? TF: I am so pleased with the design and really love the whole design so much but if I had to choose one thing I think my favorite part would be the “strings”. They create a frame around the set and the playing area and in particular my favorite part is the four piece [of violins]; the full violin, the scroll with the fingerboard, the bridge and the tail piece hanging from the strings USL. It is the extra salt in the ocean! The platform level is Brian Skarstad's violin repair shop, complete with violin pieces hanging from the strings that frame the set. The Morini Strad by Willy Holtzman is about halfway through its run at City Theatre, so we thought it would be a good time to check in with some of the artists and ask them a few questions about their experience of the process. David Whalen plays violin repairman/maker Brian Skarstad in The Morini Strad. 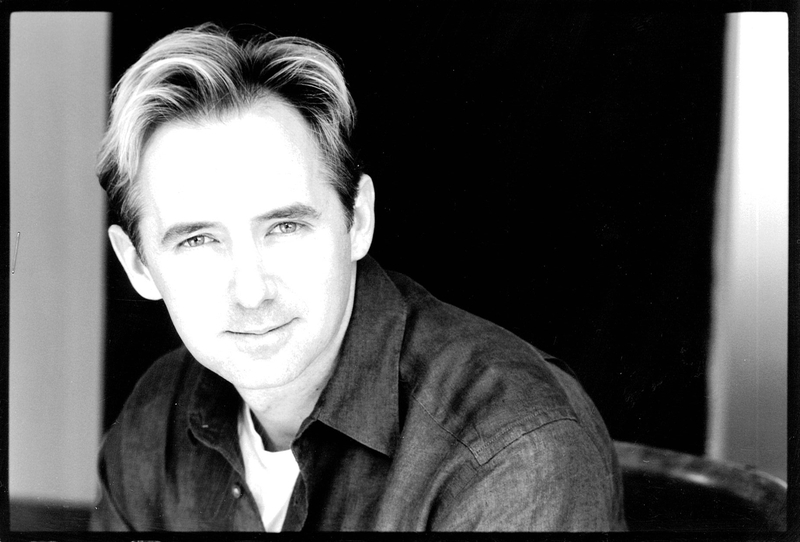 He works often with a number of Pittsburgh theatres, including PICT and the Pittsburgh Public (where he was recently playing Tony Cavendish in The Royal Family as he was rehearsing Brian in The Morini Strad). Recent City Theatre roles include the title characters in Dr. Jekyll and Mr. Hyde and O’Reilly, the scarred mill foreman, in Speak American. Michael Christie: How did you learn about the trade of repairing violins to prepare for the role? David Whalen: I did a lot of research as I do for every role. I know all about the violin—its parts, its history, the way sound erupts from a violin, etc. I watched videos about the violin process and spent time with a violin maker. MC: Do you come from a musical background? DW: I do not come from a musical background—but music has always been a part of my life—I listen to music constantly, sing when no one is (hopefully) listening. MC: What was the most difficult aspect you encountered when preparing for the role? DW: Honestly, nothing is difficult if you commit to the work necessary to gain the confidence to achieve “living” the part. Plus, when you have a great script, insightful director, tremendous actress to work opposite from, half the battle is done for you. I cannot say how wonderful this process has been—Daniella [director], Willy [playwright], Carlyn [dramaturg], Carla [actress], Tony [scenic designer], Ange [costume designer], Brad [sound designer], Tracy [artistic director], the whole creative and backstage staff at City Theatre, everyone involved in bringing this lovely show to life—it was truly a labor of love. You better make sure you bring your best—because great artists will! MC: What was it like to meet with Brian Skarstad? How did the discussions you had with him impact your portrayal of him in the play? 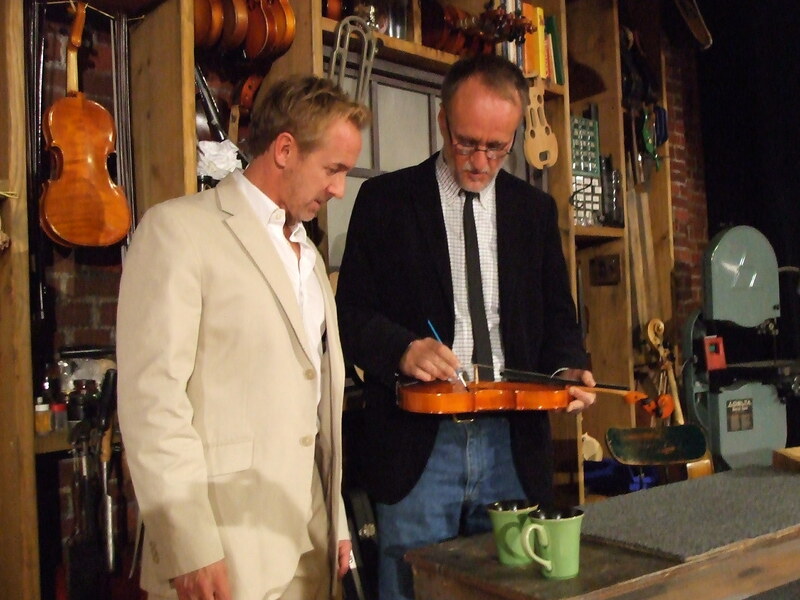 David Whalen (left) gets a lesson in violin repair from the man he plays in THE MORINI STRAD, violin-maker Brian Skarstad (right), on the "workshop" set by Tony Ferrieri. DW: Brian is such a down to earth man—I met his wife way before I met him. To me, that was very important. The reason being, I think Brian is such a selfless man—willing to do more for others than himself—it gave me great insight into his personality. Plus, I had Willy (the playwright, who is also Brian’s close friend) as my touchstone into Brian’s psyche. MC: How is it to perform in only a two-person cast of a new work? Is this your first experience in doing so? DW: Being in a two-person show, you better have ultimate trust in the other actor. Carla is so wonderful as an actor, but more importantly as a person, that it’s so easy to embrace her. She’s wonderful. I feel such a connection to her. I am so blessed to work with her and to call her a dear friend! I have done a two-person show before and am preparing to do another two-person show in Philadelphia in the Spring of 2011—Sebastian Barry’s The Pride of Parnell Street. The Morini Strad is something of a homecoming for Director Daniella Topol, who received her MFA from Carnegie Mellon University and then was City Theatre’s Associate Producing Director before heading off to New York to become a sought-after director of new work, working on staff at the National Alliance for Musical Theatre and the Lark Play Development Center, and now enjoying a thriving freelance career. The Morini Strad marks her first City Theatre-helmed production in 10 years–since she directed The Beauty Queen of Leenane in the 1999-2000 season–and we hope it’s not another 10 before we see her back again! Mary-Margaret Kunze: You’ve spent a few years away from Pittsburgh. Has your return to Pittsburgh felt like something of a homecoming? Daniella Topol: Pittsburgh was the city where I fell in love with making theater. 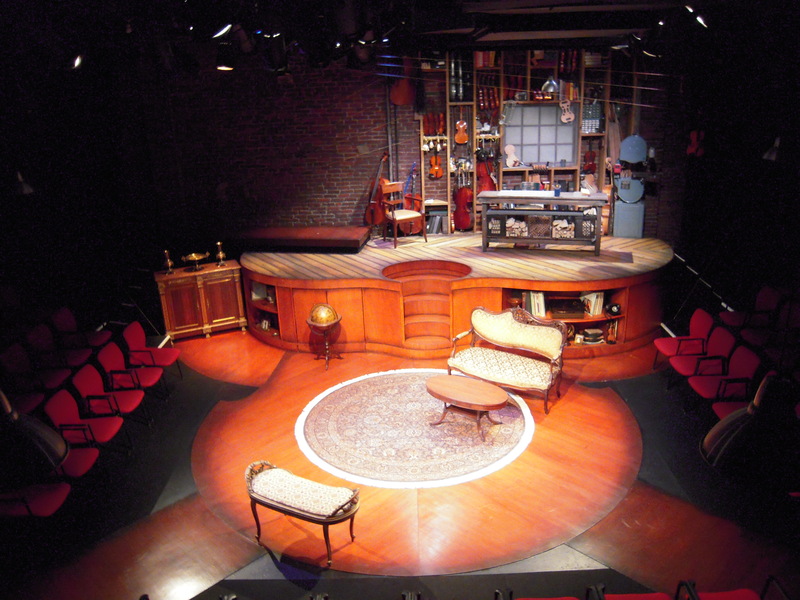 I spent my formative theater years at CMU and at City Theatre, learning the art and technique of creating plays. Learning what a life in the theater demands. Learning that this was the field I would dedicate my life to. Coming back to Pittsburgh and to City Theatre after 10 years is familiar, affirming, nostalgic, moving, challenging, overwhelming, and life-affirming. MMK: What has been unique about this experience with City Theatre? DT: It is such a joy to direct a show in a theater with so many people that I have had a history of working with from my previous tenure here. There is a familiarity and a shorthand that informs the work and makes the whole process a joy! Life as a freelance director has a certain anonymity to it – I travel to cities where I don’t know the people or the town. Not here. This truly feels like coming home again. MMK: This is the world premiere of this piece. Has that lent a new excitement to the experience? DT: Absolutely! This is the first time that Willy and I have worked together on a production (I have directed readings of others plays of his previously), and I am so thrilled to have found a true collaborator through this process. There [was] nothing like having him in the room with us making changes as we explored the language, staging, music, and dynamics of every moment. Our dramaturg, Carlyn Aquiline, has uncovered a great deal of research about Erica Morini and set up conversations with luthiers and local musicians that has also informed our production choices. These choices will then be integrated into the script for future productions. MMK: What was your experience with directing a play about real people and a real story? DT: I have directed plays based on actual events before, but I have never directed a play where I have spent a great deal of time with the people themselves. Willy and I went to Brian’s violin studio in Pleasantville. Louise Beach, his wife, has composed music for our production. I have met one of his sons who is mentioned in the play. (I only wish I could have seen/met Erica Morini!) All of these encounters have enabled me to honor the play’s authenticity and truth, without compromising the imagination that is necessary to conceive this world as a theatrical event. 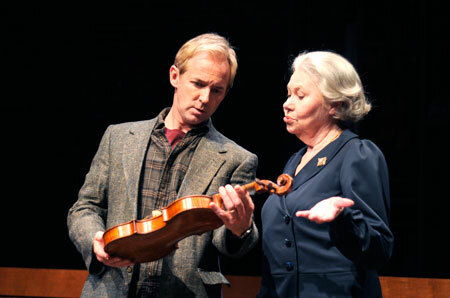 David Whalen as Brian Skarstad and Carla Belver as Erica Morini examine Erica's famed Stradivari violin in THE MORINI STRAD. MMK: Are there any aspects you are particularly proud of? passionate about this play, their roles, each other, and the process. This has enabled us to develop a level of intimacy and intensity that is so necessary in exploring this dynamic relationship. The design team has been courageous and imaginative and inspiring. Artistic Director Tracy Brigden has given us the space and freedom to explore the work while providing us with a fresh perspective and keen insights. It takes a village to make theater — I am grateful for the one that is Morini Strad‘s. This weekend is your last chance to see Tony Award-winning Michele Pawk in a tour-de-force performance in The Blonde, the Brunette and the Vengeful Redhead by Australian playwright Robert Hewett, who joined us for previews and opening night. Michele plays seven characters who offer their individual perspectives on the same event. The characters often contradict one another, at times obviously deceive themselves, and clearly manipulate some details to shine a better light on themselves. All of which means that the whole truth (whatever that is!) can never actually be known by the audience members, who must ultimately decide what they think the “truth” is. What IS true is that Michele Pawk gives an outstanding performance and that director Lou Jacob and the designers—Tony Ferrieri (set), C.T. Steele (costumes), Andy Ostrowski (lights), and Jane Shaw (sound)—invite the audience in on the fun of watching Michele transition from one character to the next as the set revolves and she changes costumes and wigs. Sometimes we get just a peek and sometimes we get the full view but the transitions between monologues—which are all like complete short plays in themselves—are a blast to watch, and the character of the production would suffer greatly without them. I don’t think the other designers will be insulted if I bring special attention to C.T. and the amazing costume design he has created, which includes the initial vision for the indispensible wigs and ongoing collaboration with wig designers Elsen Associates to develop them to their final looks. Thanks to him, Michele is able to change to a new and distinctive look for each character in a few seconds flat and, amazingly, those wigs actually make her face look different for each character. 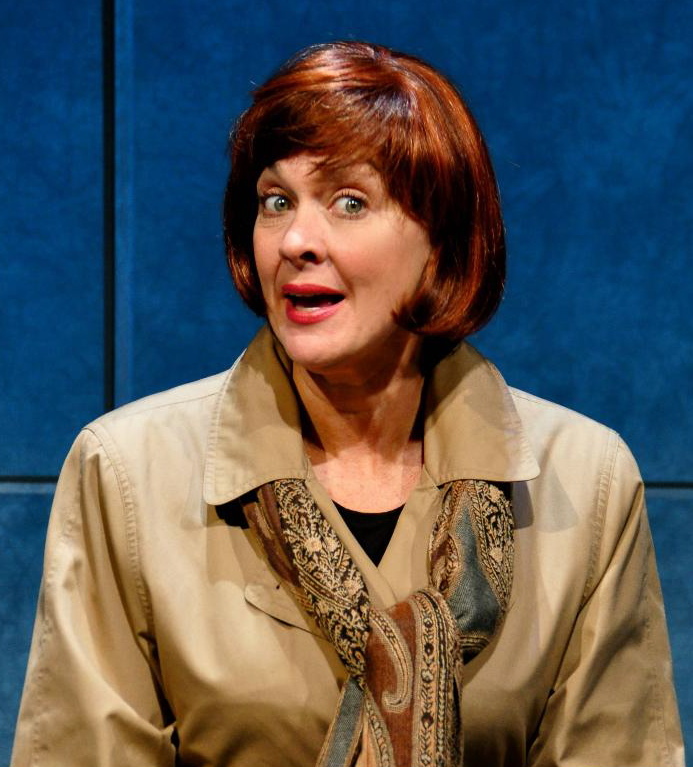 Michele Pawk as Rhonda, the "redhead," wearing the first of C.T. Steele's craftily designed costumes and wigs. They're unique to the personality and style of each character but allow for lightning quick changes in the transitions between monologues, which are great fun to watch. Post-Gazette preview article. Post-Gazette review by Chris Rawson. Tribune-Review preview article. Tribune-Review review by Alice Carter. And, for fun, here’s Michele’s “Personality Test” in today’s Tribune-Review.